Paperback, 6.5 x 9.5 in. / 168 pgs / 105 color. Manifestos by Bernard Khoury, James Turrell, Zvi Hecker, Dana Cuff, Saskia Sassen, Edward Soja, Norman M. Klein, Teddy Cruz, Michael Sorkin, Keller Easterling, Ai Weiwei, Lebbeus Woods, and many more. Edited by Peter Noever, Kimberli Meyer. 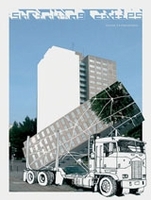 Text by Saskia Sassen, Zvi Hecker, Ai Weiwei. 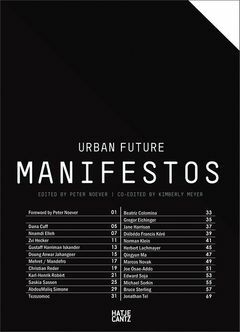 Urban Future Manifestos invites contributors from around the world to respond to the current and impending challenges facing the urban environment. 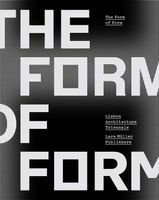 Calling on planners, artists, architects, designers, activists and myriad other cultural practitioners, this publication offers a set of interdisciplinary statements that respond to urgent issues of growth and migration, economic and political theory, and gender dynamics and ecology, as they relate to contemporary cities across the globe. Contributors present their varying practices and intellectual approaches to the problems that are affecting them most. The project is inspired by the MAK Urban Future Initiative Fellowship (UFI), which was launched by the MAK Center for Art and Architecture at the Schindler House in Los Angeles in 2008. Echoing UFI's mission, this publication aims to promote meaningful exchange between creative thinkers from diverse nations in order to cultivate visionary conceptions of the urban future. Edited by Lize Mogel, Alexis Bhagat. FORMAT: Pbk, 6.5 x 9.5 in. / 168 pgs / 105 color.